Friday, March 7, 2019. Our Electoral Democracy is the realm of contestation1 or a very open and competitive, hard and multi-issue battle. Cyberdemocracy The interaction of political communication is open and intensive. The emergence of the “third era of political communication” in which print and broadcast media will lose the main place of communication in a new era of abundant information. Political ideas, information and news can be disseminated through the Internet and communication technology with the capacity to achieve two-way current information that supports users to search for certain types of news. The Master of Government Science UMY held a public lecture with the theme “Social Media and Millennial Voters”. The event was moderated by David Efendi, S.IP MA, as well as a speaker Wawan Budiyanto, S.Ag., M.Sc as Commissioner of DIY KPU and Tunjung Sulaksono, S.IP., MA. 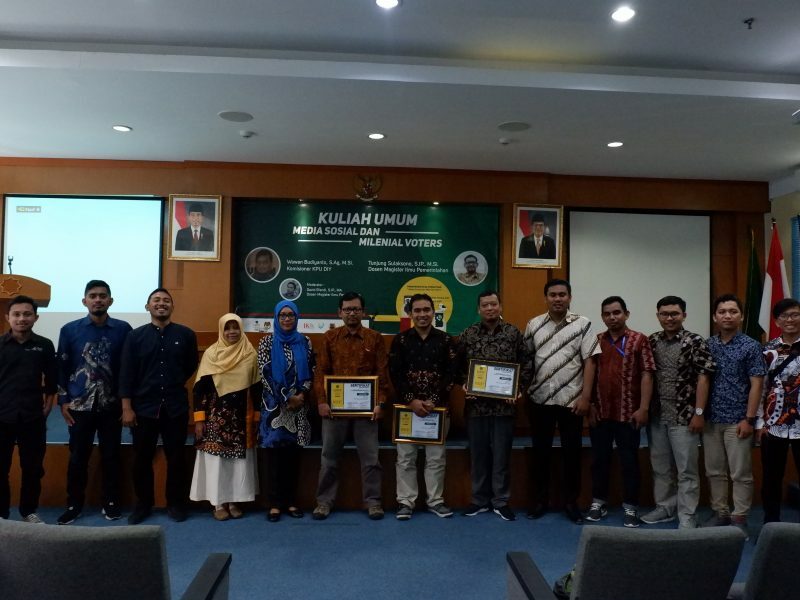 The event was opened with the presentation of the results of research conducted by KISP on “MILLENIAL SELECTION VOTERS IN SOCIAL MEDIA IN RESPONDING TO THE GENERAL ELECTION OF 2019”. Data obtained through the results of distributing Millennial Generation questionnaires and interviews in DIY with specifications aged 17-36 years. Respondents chose Generasi Millennial who were native to the Yogyakarta Special Region (DIY) which spread in Yogyakarta City, Sleman Regency, Bantul Regency, Gunung Kidul Regency, and Kulon Progo Regency. From the findings in the field the lnstagram application is an application that is widely used by Millennial Generation in DIY (86.75%), after which Whatshaap (65.5%), followed by Facebook (63.75%), Twitter (45.75%) , Row (3 8.5%). Millennials in DIY are relatively neutral in their political views, not very interested in the noise of the presidential or vice presidential candidates (serial number 01 or serial number 02), one of which is seen from the use of hashtags in their posts. Millennials prefer social media as a source of information, share meme content to criticize the government. Based on these findings, expectations of various parties such as electoral organizers and political parties can follow up data-data analysis on Millennial Voter behavior in responding to the 2019 general election. This is important as political education for the Millennial Generation. Wawan Budiyanto, S.Ag., M.Sc, as the speaker in this public lecture revealed that at present the ways to introduce themselves and their programs are still conventional, namely through various billboards that are expensive and can be discussed properly. They have not been able to use cheaper and effective social media. Seeing the figures presented from the results of the MIP research, Wawan agrees that there must be someone who uses generations to be able to exercise their voting rights in elections. However, what was interesting to Wawan, although the generation of DIY was approved, some of them were even joined as sympathizers and capitalized on political parties to socialize elections by taking to the streets. “In particular, KPU DIY invites millennials to participate in socializing the elections by re-enacting the ‘rotten anti-politician’ campaign or ‘anti-corrupt legislative candidates’,” he said. While Tunjung Sulakosono, S.IP., M.Sc, as UMY Master of Government Science Lecturer and speaker at this public lecture, saw the candidates in the 2019 elections not only have to campaign on social media, but to gain sympathy for the millennial generation. However, they also have to harmonize the world of young people by introducing appearance. “The challenge is that until now, the party is still dominated by a generation of oligarchs who need approval at lower levels, so it is difficult to be invited to work on the millennial generation,” he said.